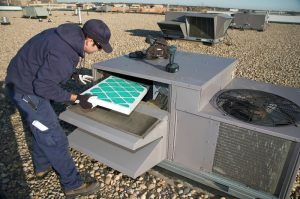 What Sets Apart Different Commercial HVAC Companies? You might believe that it doesn’t really matter what contractor you hire to handle the heating, air conditioning, and ventilation needs of your commercial facility. As long as the company is licensed, it should be fine, right? But you don’t actually believe this—not when you stop to think about it as you click around different contractor websites. As a business owner yourself, you know what sets you aside from your competition and what you strive to do to make your company better. It’s no different with commercial HVAC contractors. They aren’t all equal, and some go beyond the standard level of service that others provide. Below are some examples of what separates commercial HVAC companies in Toronto, ON from each other—and specifically what sets Advantage Airtech apart. Is it possible for a newer contractor to be able to deliver quality service? Yes, provided they can draw in the skilled and licensed technicians necessary. But there isn’t anything like experience and history when it comes to improving a company. When technicians have years working together, and a company has a few decades to perfect its services and policies, you can expect better results. We’ve served the GTA since 1987, more than 30 years. No two businesses are alike, so it makes no sense for their HVAC needs to be alike. But this is what often happens with HVAC contractors: they provide “cookie cutter” work, such as basic maintenance checklists they go down for each company. A commercial HVAC contractor worth hiring will ensure that each customer receives service tailor-made for them. When you hire Advantage Airtech, you’ll be assigned a dedicated account manager who will get to know your facility equipment and the best way to service and maintain it. You won’t have a stranger you’ve never seen before arrive at your business when you need service. Different companies have different hours, and some never shut down operations. So why would you want to work with a commercial HVAC contractor who only provides repairs and other services during business hours? You never know when you may need our expertise and equipment to help out during a major HVAC failure, so we have help ready to come to you 24 hours a day, 7 days a week. A.k.a. “The Best in Modern Commercial Technology.” More and more commercial facilities are updating to building automation and other energy management systems to improve efficiency and streamline process. Not every HVAC contractor can offer up the cutting technology your facility needs, however. Building automation and energy management are one of our specialties at Advantage Airtech. We also help with commercial energy rebates and incentives, helping your upgrades start paying for themselves. Advantage Airtech Commercial Ltd. is the Double “A” name with the Triple “A” Service in the Greater Toronto Area. Schedule an appointment with us today.